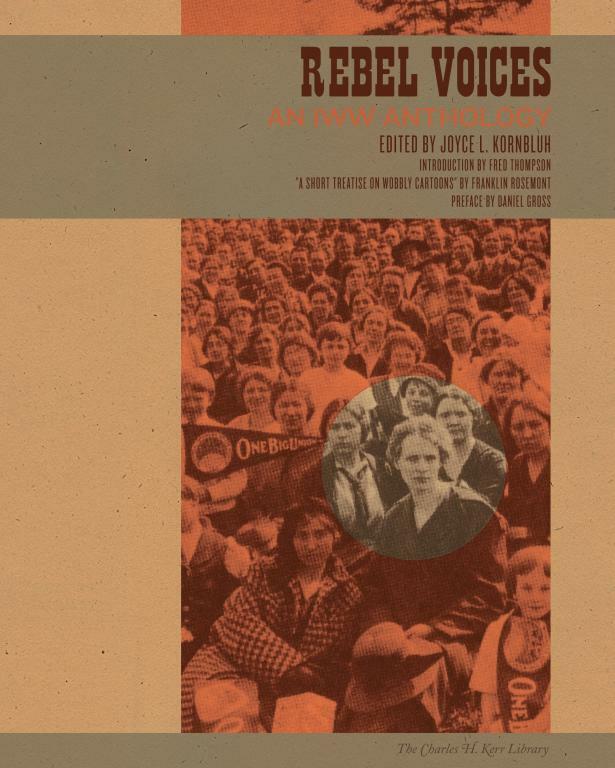 A review by Staughton Lynd of Joyce Kornbluh's recently reissued book, Rebel Voices: An IWW Anthology. Kornbluh, Joyce L., ed. Rebel Voices: An IWW Anthology. Oakland, CA: PM Press, 2011. Paperback, 397 pages, $27.95. It’s true. Whatever you thought you knew about the founding convention of the IWW in 1905, the massacre of Wobblies on the Verona at Everett, Wash., or Joe Hill’s thoughts while awaiting execution, you will know more after encountering “Rebel Voices.” This is the most important book on the subject because in it, countless rank-and-file Wobblies speak for themselves through the pamphlets, excerpts from IWW newspapers, cartoons, song sheets and other written sources brought together at the Labadie collection in Ann Arbor, Mich. This is history from below, created by the working men and women who made that history. Apart from the sheer delight of immersing oneself in the irreverent Wobbly sub-culture, Kornbluh’s compilation requires revision of several misconceptions as to what the IWW was all about. First and most important, it is commonly said that members of the IWW were opposed to written collective bargaining agreements. This perception mistakes means for ends. The Wobblies were opposed to contractual agreements that limited direct action and solidarity. At the time the organization came into being, most unions were craft or trade unions. That is, they did not include all workers at a given workplace, but only those workers who practiced a specific skill. Each craft bargained for a separate contract with the employer, covering only its own members. Thus in a steel mill, for example, there was not a single contract for “steelworkers” employed there. Rather, there were separate contracts for each of the skills involved in making steel. The very existence of such contracts tended to turn a workplace into a mosaic of different kinds of workers, each kind bound by a specific written agreement. The termination dates of the contracts were likely to differ. Even in the absence of express language limiting the right to strike, a work stoppage initiated by one group of workers was unlikely to be honored by members of different crafts. Debs, whom we don’t ordinarily think of as a spokesperson for the IWW, gave a speech in Chicago in November 1905 in which he offered precisely the same rationale for the creation of the organization and illustrated that truth from his own experience. “We insist that all the workers in the whole of any given plant shall belong to one and the same union,” Debs declared. “I belonged to a craft union from the time I was 19 years of age,” he went on. He remembered the evening that he had joined the Brotherhood of Locomotive Firemen, and the zeal with which he had labored “to build it up.” But he had come to see that a single craft union, even a federation of craft unions, was not enough, and so had undertaken to organize the American Railway Union. The employers, in response, showered favors on the several craft brotherhoods in the knowledge that these craft unions protected them from the power that “we Industrial Unionists” could exert. Referring to a specific lost strike in 1888, Debs concluded: “A manager of a railroad who can keep control of 15 percent of the old men can allow 85 per[cent] to go out on strike and defeat them every time.” (This speech appears in “American Labor Struggles and Law Histories,” ed. Kenneth Casebeer, pg. 91-99). As it happened, of course, the creation of CIO industrial unions in the 1930s did not offer workers the freedom to undertake direct action whenever they wished. The very first collective bargaining agreements between the United Automobile Workers and General Motors, and between the Steel Workers Organizing Committee and U.S. Steel, in the early months of 1937, gave away the right to strike for the duration of the contract. No law required this. The officers of the new unions as well as the giant corporations with which they negotiated feared the unrestricted direct action of the rank and file. Readers who are “dual carders”—that is, Wobblies who belong both to the IWW and to a conventional trade union—should find this clarification helpful. Fellow workers may find it difficult to understand why one should oppose written contracts as a matter of principle. They will find it easier to grasp the idea that workers should never give up the opportunity to engage in direct action when, where, and how they perceive it to be appropriate. A second misconception has to do with the idea of sabotage and the black Sabby cat that became its logo. What the word “sabotage” meant to Wobblies, Kornbluh makes clear, was “striking on the job” or “striking and staying in the shop.” Striking on the job could take a variety of forms. When workers mysteriously produce only half of what they ordinarily produce during a given shift, such a slowdown is a form of what the Wobblies meant by sabotage. When workers meticulously obey all the safety rules—rules ordinarily disregarded in the interest of getting product out the door—that, too, is sabotage as originally understood. When protesting bus drivers provided the usual service but declined to collect fares it was still another instance of the black cat at work. When lumber workers walked off the job together after the number of hours of work they considered appropriate, it was sabotage without the use of imagined wooden shoes. The same was true in 1935-1937, when Akron rubber workers and automobile workers in Flint, Mich., occupied the places where they worked rather than walking out of the plant. Such sabotage had nothing to do with violence or destruction of tools. Because the IWW itself was in a state of chaos and decline from the 1920s until recent times, the book’s account of the years 1924-1964 is fragmentary. This makes it all the more impressive that during those years the memory and mystique of the IWW continued powerfully to affect some of the most imaginative labor organizers in the country. Stan Weir, a lifelong rank-and-file radical whose writings have been collected in a book called “Singlejack Solidarity,” learned his unionism from Wobblies. Blackie and Chips were the “1934 men” who taught him the lessons of the San Francisco general strike in classes on shipboard. Likewise, John W. Anderson jumped up on a car fender to become the chairperson of the 1933 Briggs strike in Detroit, worked as a volunteer IWW organizer for three years, and later became a dissident local union president in the United Auto Workers (UAW). “I like the Wobblies’ history: the Bill Haywood stuff, the Ludlow mine, the Sacco-Vanzetti thing. I like their music. I like the things they were active in. Thus Ed Mann kept the faith with the Wobbly idea that what is needed is, in Kornbluh’s words, “not piecemeal reform but revolutionary change.” To be a Wobbly, this book affirms on every page, is to entertain a profound vision and strategy of emancipation. Like participants in Occupy Wall Street, these out-of-pocket rebels refused to be content with demanding this or that specific change. They demanded a new world. Sadly, problems associated with national conventions and similar gatherings of delegates seem to persist. IWW members are at home with local, improvised direct actions with longtime fellow workers. They are not in their element at representative assemblies encased in a myriad of procedural rules. National organizations are difficult to live in without drifting toward scheming and manipulation destructive of comradeship. I experienced my own version of political post traumatic stress disorder in reaction to the disintegration of the Student Nonviolent Coordinating Committee (SNCC) and Students for a Democratic Society (SDS) at the end of the 1960s. Pre-convention caucusing, challenging of credentials, hidden agendas, pressing for repeated votes or votes at unexpected times, interminable proposing of resolutions, nit-picking each and every suggested wording of anything, verbally abusing comrades who espouse a position different from one’s own, all express an absence of faith that we can make the road as we walk it together. I don't really find his explanation of how the IWW viewed contracts convincing. Most of the statements I've seen have nothing to with craft organization or whatever, but because they were understood as partnership with the employer or limited the workers self-activity. The Wobblies were opposed to contractual agreements that limited direct action and solidarity. To me limiting direct action and solidarity is one of the very definitions of contractual agreements and you'd be hard pressed to find contracts that ever existed that did not do these things.